You better have good insurance, if your network is not secure. It has become extremely important for any company to have network security. A high-security policy is necessary in today’s world where there are threats against private and commercial computer networks. In the business world, Cyber Security threats and malware have reached a new chapter. A clear dramatical change can be seen in the number of cybersecurity attacks during last some years. The aim of the attacks has also changed from merely gaining access to extracting data. It’s in the headlines every day. Tech support Dubai has the experience to protect your computer from virus outbreaks and hacker including removing viruses and Trojans and establishing firewalls and proxy services. We can retrieve and salvage damaged information if you have suffered any data loss. We also offer the virtual private network for those who want an extra measure of security for the remote location. 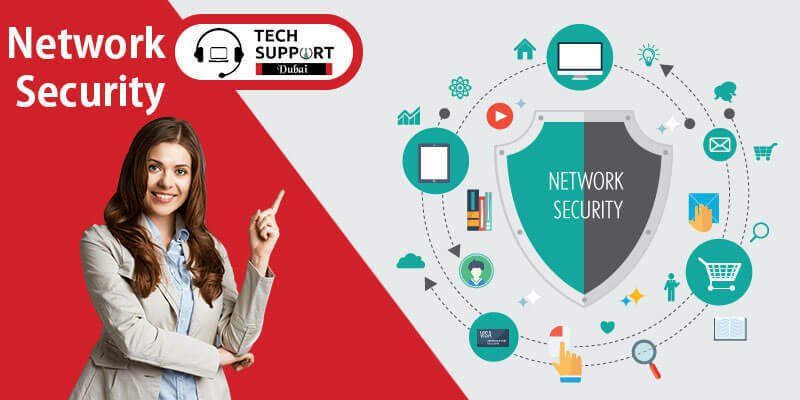 Tech support Dubai provides the best network security solution designed to address security concerns as their most probable entry points. Personalized customer service for fewer problems and faster recovery. We provide enterprise-level solutions, similar to what major corporations use, but scaled to the needs of the small and mid-sized business. Network security includes the practices and policies adopted to prevent unauthorized access, modification, misuse, or denial of a computer network and accessible resources of the network. The users choose an ID and password or some other kind of for authentication that allows a user to access the piece of information and programs within their authority. It covers the different type of computer networks, both public as well as private, which are used in everyday jobs like that of conducting transactions and communications among businesses, agencies or among the individuals. The network security attacks can be classified into two classes Passive and Active. We will eliminate the weakness of your network. Tech Support Dubai will identify suspicious employee behavior. We will keep you informed of new and emerging viruses. Tech support Dubai provides the robust network security program that addresses data security policies, contingency, and disaster recovery planning, and the need for regular vulnerability scanning and penetration testing. The goal of Tech support Dubai is to save you money and make sure your network is secure from harmful things. So, do call us and save your network from the being unsecure.